James Davis, professor of mathematics, has been awarded $25,000 from the National Science Foundation to support a conference series that explores mathematics critical to modern communication. “Finite Fields and their Applications” is a biannual conference series being held this year in Vancouver, Canada, at Simon Fraser University. The conference explores finite fields, an area of discrete mathematics critical to modern communication, and covers three major areas: Theory, Computation, and Applications. The NSF funding will support travel and attendance costs for 14 US-based conference participants with a focus on supporting underrepresented and early-career researchers. “Math is an important part of balancing speed, accuracy, and security in so much of what we do on a daily basis from texting to shopping online to streaming video,” Davis said. 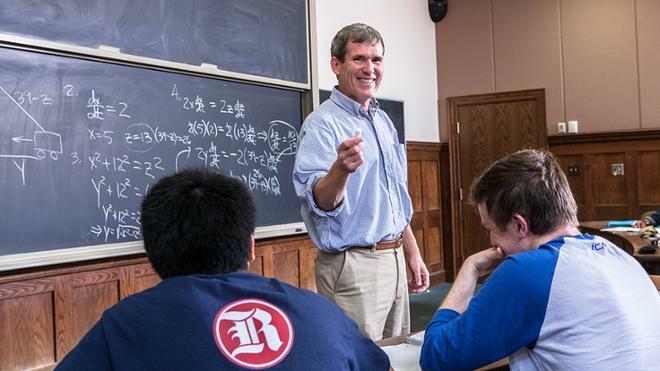 Davis has taught at the University of Richmond since 1988. He has received grants from the National Security Agency, the National Science Foundation and most recently received a Fulbright Global Scholar award with research visits in Paderborn, Germany, Paris, France, and Vancouver, Canada. He received his Bachelor of Science degree from Lafayette College and masters and Ph.D. from the University of Virginia. The National Science Foundation (NSF) is an independent federal agency created by Congress in 1950 "to promote the progress of science; to advance the national health, prosperity, and welfare; to secure the national defense..." NSF supports basic research and people to create knowledge that transforms the future. James Davis, professor of mathematics, has been awarded $25,000 from the National Science Foundation to support “Finite Fields and their Applications,” a biannual conference series being held this year in Vancouver, Canada, at Simon Fraser University. The funding will help defray the travel and attendance costs for 14 US-based conference participants with a focus on supporting underrepresented and early-career researchers.